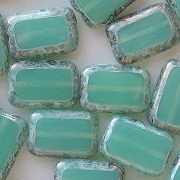 12mm (long) x 8mm (wide) x 4mm (thick) flat rectangles with bevelled edges and hand-polished sides. 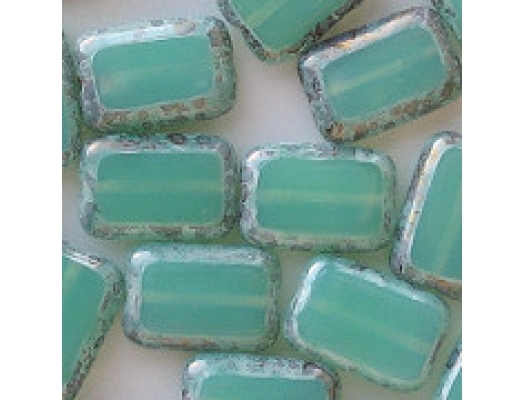 Milky teal (i.e., greenish aqua) with a coating around the edges that is a light plum purple but also bronze. 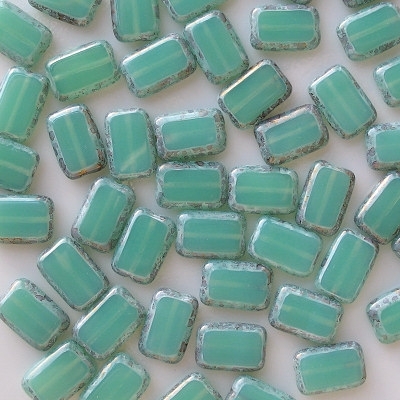 Beads with significant defects (cracks, partially polished windows, large pits or scratches, spots of picasso coating on the sides, and deformations) are eliminated before shipping; but beads with minor defects are not counted as defective. Minor defects include very small spots of picasso coating on the sides; picasso coating that has gotten into the holes, making the holes look dark; very small pits; and short, shallow scratches. These beads keep changing. The original beads had a grayish picasso coating around the edges (that's the one pictured). Subsequent batches had a picasso coating that had some plum purple in it. The previous batch to the current one had a more pronounced plum purple coating. The batch that I got in April, 2013 has gone back to having a little plum purple in the coating, but not much. The current batch definitely looks more like the picture than the previous batch. Also, the various batches have had more or less milkiness to the glass (the current batch is very close to the picture). One thing I can say, however, is that all the varieties of this bead have looked good.